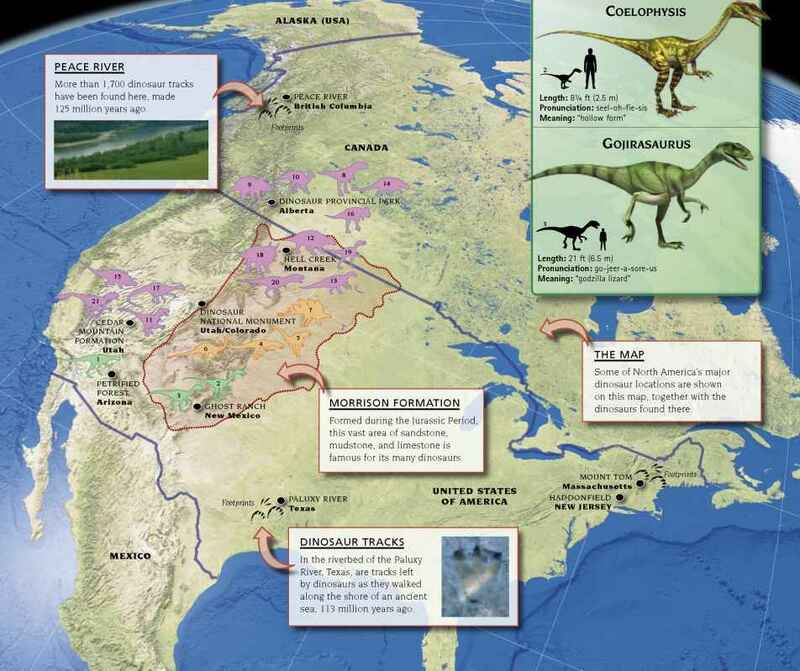 Dinosaur fossils have been discovered at nearly 300 different locations in North America. They are found in the western interior, the southwest, and the eastern seaboard, in rocks that formed during the age of dinosaurs, from the Late Triassic to the end of the Cretaceous. Throughout these 170 million years, an unknown number of dinosaur species lived on the continent's slowly changing landscape and, so far, paleontologists have identified about 70 different kinds. 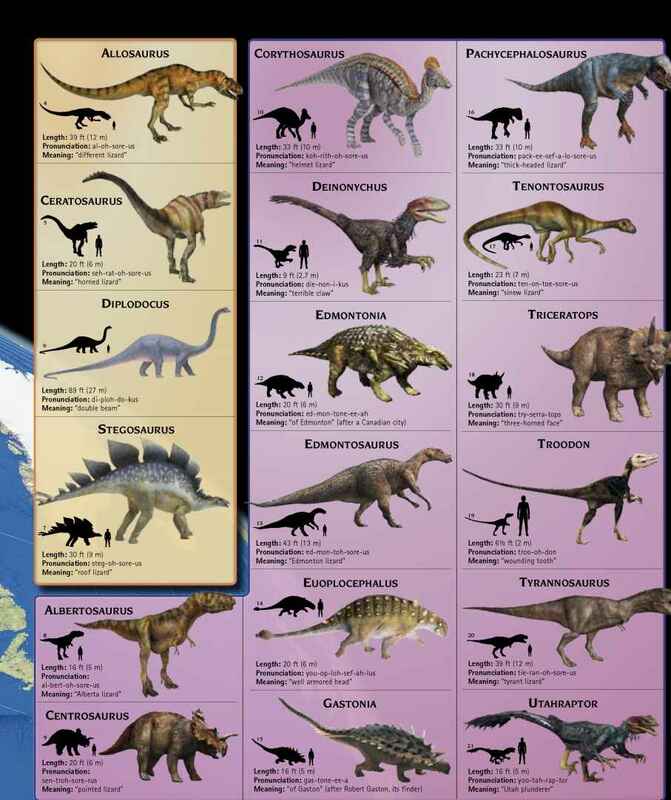 They belong to all the major dinosaur groups, and several species, such as Tyrannosaurus, Diplodocus, and Stegosaurus, are some of the best known dinosaurs in the world. Length: 8V4 ft (2.5 m) Pronunciation: chin-de-sore-us Meaning: "Chinde lizard"
One of the world's great dinosaur locations is Dinosaur Provincial Park, along the Red Deer River in southern Alberta, Canada. In 1910, after a farmer found dinosaur bones on his land, paleontologists began to study the area. 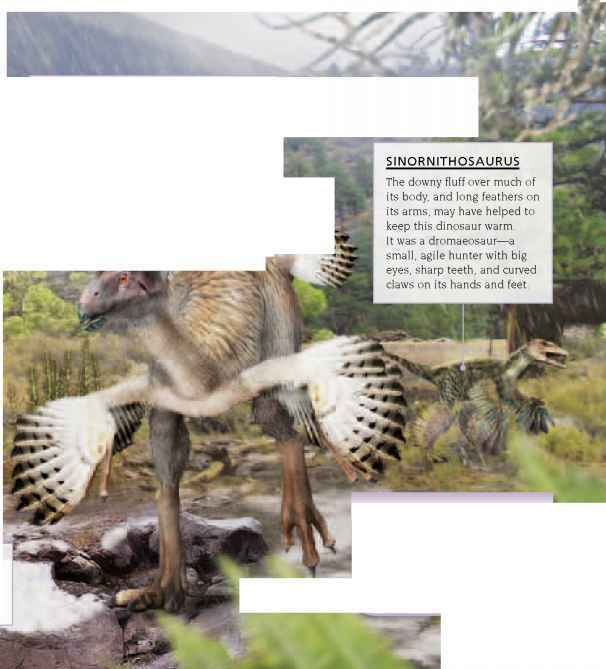 Almost 40 different species of Late Cretaceous dinosaur have been found here, including Corythosaurus, Centrosaurus, Pachycephalosaurus, and Euoplocephalus. They lived about 75 million years ago, when the area was marshy land at the mouth of a river and the climate was warm. 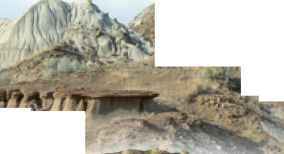 Today, Dinosaur Provincial Park is a vast area of rocky, arid land. Q, m m inosaur Provincial Park t .
Dinosaur Provincial Park was established in 1955, and in 1979 it became a World Heritage Site. The park covers 28 sq miles (73 sq km). The area was once a subtropical forest of giant redwood trees and palms, swamp grass, and reeds. 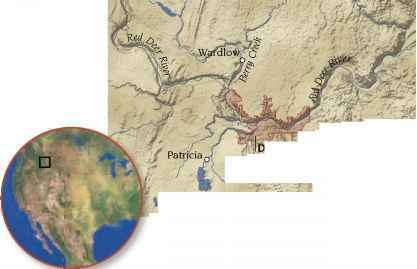 Rivers flowed through here, shedding sediments that set into layers of rock. Time passed until, 12,000 years ago, meltwaters from retreating glaciers cut through the rock, leaving the terrain seen today. A Centrosaurus bone bed was unearthed in Dinosaur Provincial Park—it held the remains of more than 50 individuals. Scientists believe that they may have been washed away together by a storm. This strange-looking dinosaur is the only species of ankylosaur (armoured dinosaur) found at Dinosaur Provincial Park. A two-ton plant-eater, its head and back were covered in bands of bony nodules, and its tail ended in a heavy bone club. Even its eyelids had a layer of bone over them. These features were for self-protection, shielding Euoplocephalus from meat-eating predators.